AvoDerm Natural Lamb Meal & Brown Rice Formula Adult Dog Food uses Vitamin Rich California grown Avocados for Healthy Skin & Coat ! Lamb is used for dogs with sensitive stomachs. Avoderm is antioxidant rich for a healthy immune system and is highly digestible. Healthy Skin and Coat on the Outside Means A Healthy Dog on the Inside! The condition of a dog's skin and coat is frequently a reflection of overall health. Poor skin health can sometimes be traced to dietary insufficiencies or imbalances. Problems with the skin and coat are never just cosmetic. Symptoms such as hair loss, thinning coat, dullness, dry flaky skin, excessive scratching, thickened skin, infections, and odors can often be traced back to either a shortage or an excess of a specific nutrient. In fact, there is no more visible indicator of problems with your dog's overall health than problems with the skin and coat. The right nutrients in the right proportions are indispensable to keeping your dog healthy. Why Avocados? Many of the nutrients your dog needs for a healthy skin and coat can be found in the remarkable fruit known as the avocado. Nutrient rich avocados contain vitamins A, E and C in abundance. They're also an excellent source of balanced nutritional essentials for your dog's skin and coat health-and good health in general. Avocados are high in folate, potassium, niacin, essential fatty acids, and many other nutrients. They have no cholesterol, very little sodium, and are high in monosaturated fats. Ounce for ounce, the avocado is simply one of the most nutritious fruits there is. Proven Formulas with Quality Ingredients AvoDerm Natural provides quality protein sources that are ideal for adult dogs with sensitivities to other protein sources. AvoDerm uses only quality ingredients in all their formulas to provide healthy, balanced levels of protein, fat, and nutrients for adult dogs-no by-products. High quality ingredients eliminate the need for unnecessary preservatives and additives- things your dog's diet definitely doesn't need. AvoDerm has only vitamins E & C to ensure freshness and palatability. Lower Stool Volume Benefits Everyone! Let's face it; cleaning up your dog's waste doesn't exactly qualify as quality time. We know you'd rather spend time having more fun with your dog. 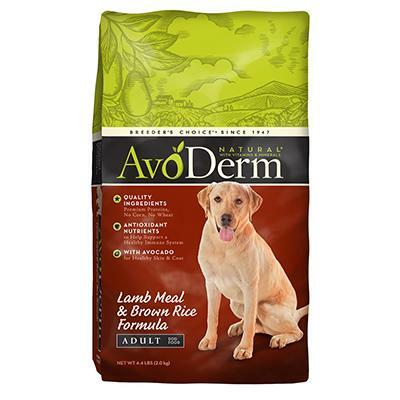 AvoDerm Natural provides your dog with high digestibility. The results are lower stool volume and better nutrition for your dog-and less clean up for you! Select Ingredients: Chicken Meal, Ground Whole Corn, Corn Gluten Meal, Chicken Fat (Preserved with Mixed Tocopherols), Ground Whole Brown Rice, Ground Whole White Rice, Tomato Pomace (Source of Lycopene), Herring Meal, Avocado, Natural Flavor, Egg Product, Chicory Root, Salt, Whey, Potassium Chloride, Vitamins (Choline Chloride, a-Tocopherol Acetate (Source of Vitamin E), Niacin, Vitamin A Acetate, Thiamine Mononitrate (Source of Vitamin B1), Calcium Pantothenate, Pyridoxine Hydrochloride (Source of Vitamin B6), Menadione Sodium Bisulfate Complex, Riboflavin Supplement, Ascorbic Acid (Source of Vitamin C), Vitamin D3 Supplement, Vitamin B12 Supplement, Folic Acid, Biotin), Minerals (Zinc Sulfate, Zinc Amino Acid Chelate, Iron Amino Acid Chelate, Ferrous Sulfate, Copper Sulfate, Manganese Amino Acid Chelate, Copper Amino Acid Chelate, Manganous Oxide, Sodium Selenite, Calcium Iodate), Avocado Oil, Lecithin, Taurine, Calcium Carbonate, Parsley Flakes, Kelp Meal, DL-Methionine, Yucca Schidigera Extract, Inositol.